Last night my friends Jeff Loewenfels and Judith Hoersting invited me to join them for dinner. 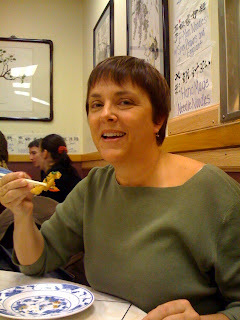 Their cousins Jonathan and Ceclia Weber live in Seattle and when Jeff and Judith visit, they all go out for Chinese food. Cecelia is from Hong Kong (she and Jonathan met there) so needless to say, she knows her stuff. We walked into Hing Loon and I was sure we were in for a treat. 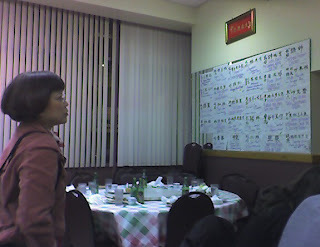 The menu was written on sheets of 8.5 x 11 paper, pasted up on all four walls. Kids ran between crowded tables. The light was fluorescent. Who cares? It smelled terrific, and the place was full of happy people eating. Hing Loon is all about the food. 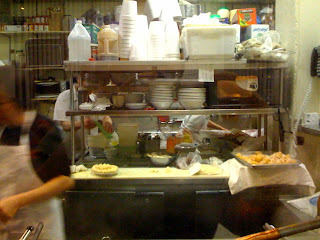 A window behind our table gave a glimpse into the kitchen: busy, clean, and crowded! We put ourselves in Cecelia's hands and this is what she chose for us: cured jellyfish (crunchy outside, gelatinous inside), spring onion pancakes, salt and pepper squid (deep fried yet light, with some very hot peppers), crispy, 5-spice chicken (exquisitely spiced with crunchy skin cooked to perfection), sesame buns stuffed w/pork mincemeat and pickled vegetables, beef with black bean sauce, pea vines w/garlic (young mung bean plants, so tender), duck and mushrooms in ginger sauce. Several of these dishes were new to me...a rare treat indeed. We were too full for dessert, but along with the fortune cookies came a soft cake-ish thing: a sesame ball. It had the texture of mochi and achieved a perfect balance between savory and sweet. I had two. Sounds delicious, and I'll have to go there the next time I'm in Seattle! Wow, it sounds incredible! Our sister-in-law introduced me to those sesame balls (and as I remember, I also ate two right after declaring I couldn't eat another thing). When in doubt, always eat two! i LOVE sesame balls and mochi!!! the whole thing sounds SO good!! I've never tried jellyfish. Interesting.